Gold is valuable but jade is invaluable. 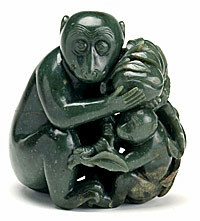 In a nineteenth-century Qing Dynasty (1644-1912) jade, two monkeys are shown presenting a peach. This work recalls the folk legend of an impish stone monkey who came to life and brazenly stole the peaches of immortality from the ruler of heaven, the “Jade Emperor.” As the monkey explained, "Nothing could content me but to live in the Green Jade Heaven!" For the Chinese, jade had been the physical manifestation of spiritual virtue, the embodiment of all that is most desirable, for several thousand years. Nearly three millennia before the monkeys-and-peach jade (around the period of Egypt's Middle Kingdom), songs from the ancient classic the Shi Jing ("Book of Songs," written 1000-700 BCE) had celebrated the glories and delights of jade. One poem sings of "this jewel, this jade of my delight," another soberly states "I bestow upon you a jade scepter and a jade goblet," a third hails "a gentleman / lovely as the glint of jade / lovely as the glint of jade." Two Monkeys Presenting a Peach. Qing Dynasty (1644-1912), 19th century, B60J968. The piece refers to the famous episode from the legend of Monkey, in which the Monkey King eats the forbidden peaches of immortality. The story was made into a novel by Wu Chengen, entitled Journey to the West. IWhat is jade and how is it used? If a ruler perfectly observes the rites of the state, white jade will appear in the valley. The Chinese have been continuously creative in working jade for more than six thousand years, from the Neolithic to the present. But China is hardly the only culture to place a high value on jade. Jade of one type or another is found in Burma, Central America, Brazil, Canada, Japan, India, Siberia, Finland, Tanzania, and elsewhere; in this country, it occurs in California as well as in northeastern and southwestern states. It is prized for its hardness, glassy luster, and rich translucent colors. Because jade is extremely hard, it might have been tried early on for tools and weapons. But jade is also brittle, and the forms that have survived appear to have been used for symbolic rather than utilitarian purposes. Jade clubs, for example, were used to represent authority among the Maori. Knives, daggers, and scepters were used in ritual or military ceremonies in China. Jade often possessed not just symbolic but belief-system significance -- as seems the case with the mysterious bi discs and cong tubes found in Neolithic Chinese grave sites (the former are discs with a hole in the center, the latter a tube that, in section, is square on the outside and round on the inside). In ancient times, as today, jade was also used for personal adornment. Jade rings, bracelets, pendants, beads, and the like appear very early. Exceptional artistic effects can be achieved with jade -- outside of Asia, some of the most stunning work was created by Central American artists of Olmec, Toltec, and Mayan cultures. Still, no culture can rival China for the breadth, depth, richness, and variety of work in this medium. Bi disc, Neolithic period, Liangzhu culture (3100-2200 BCE) B60J957. 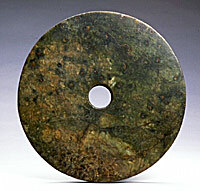 "Bi discs"are ritual jade objects found in Neolithic tomb sites. Chinese sources state that the discs symbolized the sky or the heavens, but these texts are from the Bronze Age, and the original significance of the discs remains a matter of debate. This is one of the largest known bi discs from the Liangzhu culture, with an intricate design incised along the edge. Cong tube with monster faces, Zhejiang province, Neolithic Liangzhu culture (3100-2200 BCE), B60J603. The mask design identifies the piece as Liangzhu. It may represent a deity serving as an attendant or a vehicle of the sun god; the cong shape may represent the earth. "Jade” is really several stones -- or at least that is the usage of the Chinese word, yu, which was applied even to stones such as serpentine and aventurine that are no longer considered types of jade. The English word jade is properly applied to two distinct stones: nephrite and jadeite. 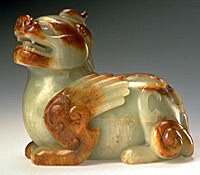 Nephrite, either from local source or imported from central Asia, was almost the only jade used by the Chinese until around the time of the American revolution, when jadeite was introduced from Burma. Although quite different in mineralogical composition, the two stones share many qualities. A milky, soft-colored stone, nephrite is a calcium and magnesium silicate with a tightly bonded, fibrous structure. It is usually white, green, or violet but can be other colors as well. Jadeite, a sodium and aluminum silicate, comes in more colors, ranging in tone from white to gray and in hue from yellow-orange to violet. But it is best known for the bright green of the highly polished form that is favored for jewelry, where it is cherished for its high luster. Jade's spectrum of colors is the result of trace elements -- such as magnesium in green jade or iron in jades with a yellowish hue -- mixed in with the snowy white of the pure mineral. Unicorn. Qing dynasty (1644-1912) 19th century, B60J837. Accents of red color created by allowing oxidation on the surface add to the artistic effect of this unicorn, a traditional guardian figure in tombs or gardens from the Tang dynasty (618-907) onward. Without being worked, jade cannot be shaped into a vessel; without being educated, people cannot be shaped into virtuous citizens. Jade cannot be carved. Because of its hardness, it can rarely be shaped by chiseling or chipping but must be worn away by abrasion with tools and hard sand pastes. This is a process that requires immense patience -- even with modern machinery equipped with diamond-tipped burrs that grind out intricate designs, it remains laborious. 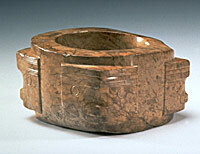 Yet jade appeared in Chinese culture several thousand years before metal tools existed. Neolithic jade artisans worked with bamboo, bone, and stone tools, using a drilling or bow action to abrade the jade with sand. Because the process was so labor-intensive and time-consuming, jades reflected the ability of a ruling elite to command resources, and therefore came to symbolize power, status, and prestige. Vessel with overhead handle, Qing dynasty (1644-1912), early 20th century, B60J24. Carved from a single piece of jade, this vase, with its loose double ring chain supported by a fanciful phoenix bird, is a technical marvel. The wise have likened jade to virtue. Neolithic jades -- such as the bi discs and cong tubes described above -- are often found in burial sites, suggesting a ritual significance. By the time of the Zhou dynasty (771-221 BCE), when the Book of Songs was written, the prescribing of jade as an aid to attaining immortality was well established. Deceased royals might be buried in a jade suit with jade plugs inserted in body openings. The use of jade in burial ritual continued into and beyond the Han Dynasty (100s BCE-100s CE, about the period of Julius Caesar and the Roman Empire), when in addition to body plugs, other jade objects were interred with the deceased. Jade cicadas, for example, representing rebirth, might be placed on the deceased person's tongue. 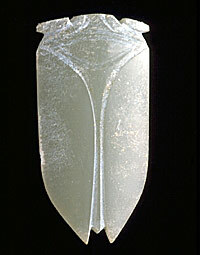 Cicada, Han dynasty (100s BCE-100s CE), B60J583. Cicadas were associated with rebirth, since they live underground for years before emerging and shedding their skin in the final stage of their life. This abstracted cicada would have been placed on the tongue of a deceased person, along with jade plugs at other points in the body, as a way of preserving the vital spirit or qi, in a jadelike state of permanence. 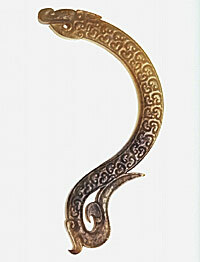 Early dynastic jades also took the form of belt hooks, archer's rings, and guards for swords. During the earliest Chinese dynasties, the Shang and the Zhou, pendants became an increasingly popular adornment. Through the centuries, jade ornamentation had become increasingly codified, so that by the Han dynasty its use as a means of distinguishing one's social class was firmly entrenched. 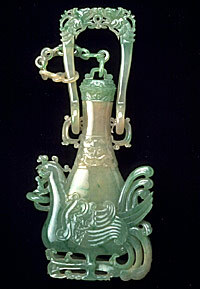 Huang pendant. Eastern Zhou dynasty (771-221 BCE) B60J688. This graceful, semicircular pendant was probably worn during the owner's life and then buried as a prized possession. The open heart-shaped motif with delicately incised parallel lines on the body of the dragon is a distinguishing feature of jades from this period. Fewer jades survive from the centuries from the fall of the Han dynasty in 220 through the end of the Tang dynasty in 906 than from earlier or later dynasties. Changes in funerary practices meant that not as many pieces were included in tombs where they were protected from the ravages of time. In addition, these works had not completed the transition from ritual object to cultural artwork and were not collected as they were in later dynasties. The earliest animal figures from this time of transition show something of the ritual spirit of the Han dynasty, but they soon evolve into fanciful mythical beasts and playful representations. During these centuries signs of an emerging antiquarian spirit appear in jade imitations of early metallic or ceramic objects. This anticipates an important trend in China from the Song dynasty (960-1279) onward. In the modern dynasties (the Ming, 1368-1644, and the Qing, 1644-1912) jadework became more self-conscious and referential. Often—as with the monkey-and-peaches sculpture—jades alluded to a work of literature or some other aspect of China’s cultural heritage. Or they might involve a sort of witticism known as a rebus. Rebuses are hidden meanings or verbal puns arising from characters that have double meanings; they usually refer to auspicious signs or wishes. Buddha’s hand citron, Ming dynasty (1368-1644), 19th century, B60J9+. The fruit shown here is used as a medicinal plant, and as an offering during Chinese New Year. It contains both a visual and a verbal pun: its shape resembles the fingers of the Buddha, and its name, foshou, resembles the words for blessings (fu) and longevity (shou). During this period, jade objects for the scholar's studio began to be produced, such as brush rests, paperweights, and seals. In keeping with the referential spirit of the modern period, such objects were sometimes made in imitation of earlier forms in other mediums, such as bronzes and lacquers. Vessel with handle and three legs of bronze jia shape, Qing dynasty (1644-1912), 19th century, B60J288. 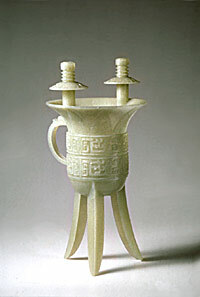 The Chinese love in the modern period for imitating forms in other mediums is illustrated by this jia, or wine vessel. Its model a bronze vessel used in the ancestral rituals of the ruling Shang elite, this jade object has become a delicate display piece showing the owner's good taste and admiration of antique forms. 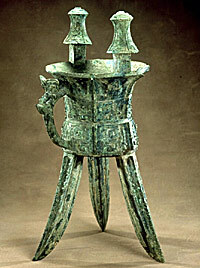 Compare this large bronze jia, to the 19th-century jade jia vessel above. This is one of the first jobs I did at the Asian Art Museum, a brochure accompanying the reopening of the museum's jade galleries. Brian Hogarth, the museum's director of education, prepared a first draft, which I rewrote extensively. I post this here in the spirit of supporting the museum's educational mission. The photos are all by Kaz Tsuruta. All of these objects are in the museum's permanent collections. Basic admission to San Francisco's Asian Art Museum is currently $12. Membership is a good value, and the first Tuesday of each month is free.